If you’re headed to an airport, train station, shopping mall or other public space swarming with people this holiday season, there’s a pretty good chance you’ll come into contact with the flu. (That recluse life is looking better and better, I know.) 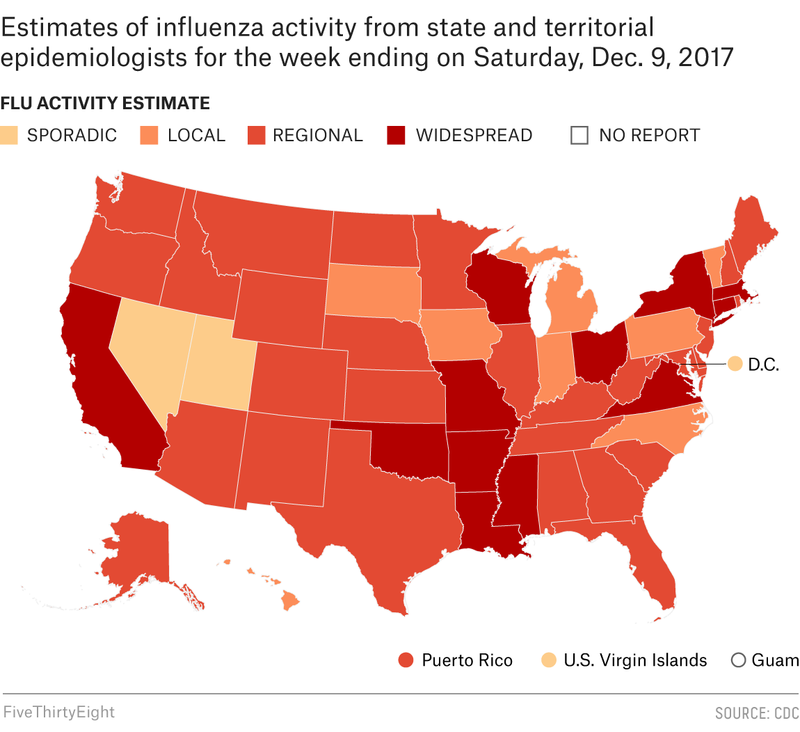 Flu season is just starting (see the map below for where it’s hitting hardest so far), but if the H3N2 viruses that are circulating now continue to predominate, “it could mean that this could be a pretty bad flu season,” said Brendan Flannery, an epidemiologist for the CDC’s Flu Vaccine Effectiveness Network. Don’t want to catch it? Sure, get a flu shot. But there are other more routine steps to take too: Stock up on soap and consider wearing a face mask. It turns out that good hygiene is one of your best defenses against the flu and flu-like illnesses. Influenza isn’t just an inconvenience. It can be deadly. Depending on the strains in circulation, the flu sends 140,000 to 710,000 folks to the hospital every year in the U.S. and kills anywhere from 12,000 to 56,000 people. A lot of public health messages about influenza focus on the vaccine. That’s understandable, because getting the general population vaccinated can presumably help reduce the spread of the illness to the most vulnerable people, like children and the elderly. We know that vaccines save lives. But the flu vaccine is different from immunizations for childhood diseases like measles and rubella, or even conditions like hepatitis. The flu vaccine’s target is a virus that mutates very rapidly, usually faster than the vaccine can be made. Prior to each flu season, researchers take their best guess about which strains will circulate so that they can include them in that year’s vaccine, but they’re not always right. In a commentary published last month in The BMJ, Del Mar argues that public health measures should focus more attention on hygiene. The influenza vaccine “doesn’t seem to be a terribly good horse to back” when it comes to fighting flu epidemics or even protecting yourself as an individual, he told me, and putting so much emphasis on the vaccine may give people a false sense of safety. “We should stop promising what we cannot deliver.” People who get the vaccine should realize that that’s only a first step. So, what are those next steps? “It’s really the sorts of things your mother told you to do as a child,” said Richard Webby, an infectious disease researcher at St. Jude Children’s Research Hospital. First, avoid touching your eyes, nose and mouth, which are places where germs from the environment can enter your body. Finally, be sure to dry your hands afterward. Wet hands transmit germs more easily than dry ones. The best method of hand-drying isn’t clear, but a 2012 review concluded that paper towels are better at stopping germ spread than electric air dryers. If you’re the one coming down with something, sneezing or coughing into a tissue or your sleeve (for instance, by adopting the “Dracula Sneeze” into your elbow) can prevent you from spreading your crud. (Coughing into your hand just sprays the germs all over your palms and fingers so you can spread them on all the things you touch.) Staying home when you’re sick is another important habit. This is all common sense advice that most of us know, but a 2011 study observed people in public places during a flu pandemic and found that most people didn’t follow it. For hygiene practices to work, they need to become standard behavior, not just something that you do when you suspect there’s someone sick around. You can’t assume that you can tell who’s a carrier. It’s possible to spread a flu or influenza-like virus for a few days before symptoms appear, said Webby: “There’s a window between infection and when symptoms begin.” A fever is a good sign that you’re infectious and contagious, and the CDC recommends staying home for at least 24 hours after your fever is gone. Changing the culture so that people are discouraged from going to work sick, rather than heralded for making such an effort, would help, Webby said. Another culture change that might help: an acceptance of wearing masks in public. A 2011 review concluded that wearing a mask was “the measure with the most consistent and comprehensive supportive evidence” to combat the spread of the flu. But with the exception of a few countries, like Japan, it’s unusual to see someone wearing face coverings when out and about, Del Mar said. Masks serve two purposes: They prevent sick people from broadcasting the virus into their surroundings, and they prevent healthy people from inhaling or otherwise picking up the virus through the environment. A 2008 study found that people in a household where someone had the flu or an influenza-like illness had a greatly reduced risk of getting sick if they regularly wore a mask. Pushing people to practice better hygiene comes with a side benefit: It also slows the spread of other bugs, including colds and influenza-like illnesses — infections that cause similar symptoms to the flu but are caused by different pathogens. Determining whether it’s the flu or something else can be important for public health officials tracking the illness, but if you’re the one who’s sick, it won’t matter to you which virus it is.